Very Good. 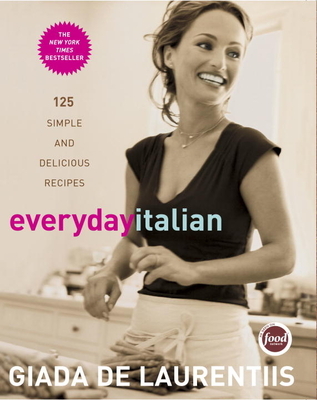 Everyday Italian: 125 Simple and Deli by LAURENTIIS, GIADA DE, 2005-02-22. Sewn binding. Cloth over boards. 256 p. Contains: Illustrations. Good. Open Books is a nonprofit social venture that provides literacy experiences for thousands of readers each year through inspiring programs and creative capitalization of books. Giada is a great chef and this book demonstrates another of her strengths, the ability to pass on her skills and ideas to others. This is a great book for learning tips and tricks for cooking great Italian food along with the fully constructed recipes she provides. Buying a cookbook with only 125 recipes might sound like a waste, but these are recipes you might actually use. Unlike some of the Italian cookbooks I've got, this one doesn't assume that you'll have access to fresh and unusual ingredients, or that an Italian market is down the street stocked with specialty products. About the most difficult ingredient is the amaretti cookies, and for most recipes, those can be omitted, or you could substitute something else. This book is definately produced with an average American kitchen in mind. And if there is some ingredient you can't get, chances are that you'll be able to figure out something that will be an acceptable substitution. Recipes range from fast and simple, like crostini, to more complicated dishes like lasagna. You'll find classic sauces like Alfredo along with Giada-style dishes like Eggplant Rollatini, which is her variation of eggplant parmesan. Along with the recipes, there are sometimes tips, like how to best freeze your uncooked ravioli, or what consistency your pesto should be if you want to serve it on pasta. Things like this make the cookbook just a little more useful, and a little more interesting as well. So far, Giada's recipes have all worked out for me, and it's a good bet that the others will work out just as well.